Vodafone has confirmed to TechRadar that the incoming Samsung Galaxy S3 is a sales record-breaker already. The new phone, which features a 4.8-inch HD screen, 8MP camera and a host of new fancy software features, was one of the most hyped phones before launch, and now the big red network has confirmed this is the case. 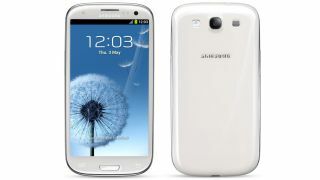 A spokesperson told TechRadar: "We've been really encouraged by our customers' response to the Samsung Galaxy SIII. "With over a week to go until launch, it's already the most pre-ordered Android device we've brought into our smartphone line-up to date and our limited time offer of 2GB of mobile data and 100 free music tracks is being snapped up." Self-promotion from the network aside, it's an interesting point to see outlets getting as excited over an Android phone as one from Apple - although clearly pre-orders haven't reached those levels. The Carphone Warehouse has echoed these findings, stating "Pre-order demand for the new Galaxy SIII has surpassed expectations since the handset was first unveiled two weeks ago. The first 24 hours alone saw thousands placing their pre-order at Carphone Warehouse". With worldwide pre-orders apparently reaching 10 million already, it seems Samsung is going to have an even larger hit on its hands than the Samsung Galaxy S2, and is well on its way to reaching the 20m sales the predecessor garnered by February 2012. Update: We contacted the other UK networks, with O2 saying they don't comment on sales, while Orange provided us with the following statement: "The Samsung S3 is proving hugely popular and we've seen a great deal of interest from customers". We are still waiting to hear back from T-Mobile and Three, and we'll update this article when we do. Update: Nigel Field, Director of Devices at Three commented, "Pre-orders for the Samsung Galaxy S3 are tracking phenomenally well". And don't forget, the Samsung Galaxy S3 isn't the only thing breaking records, our Mobile Devices team are also world record holders.